For weeks it has been the elephant in the room, lurking in the background while everyone has desperately tried to ignore its presence. Sunday’s showdown with Championship leaders Rangers has overshadowed everything Hibs boss Alan Stubbs and his players have done, the focus on this match forgetting that both sides had important games to play in the meantime. 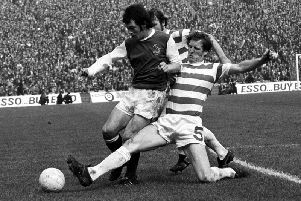 As such, Stubbs repeatedly refused to become embroiled in any discussion about a clash which, even with the season barely a quarter gone, could have a significant impact on the title’s ultimate destination. Regardless of what happens at the weekend, the Ibrox club will remain in the box seat, their advantage either cut or extended or even unchanged but whereas a few weeks ago all the talk had been of how quickly Mark Warburton’s side could wrap things up the Capital club are now being regarded as genuine contenders. There’s no getting away from the fact the Govan outfit have made a scintillating start to the season, emerging victorious in all ten of their opening league fixtures but whereas they were simply blowing teams away, scoring 19 goals in just four games at one stage, they have, by all accounts, been a little less assured recently. Hibs, meanwhile, have been quietly building momentum, nine victories in an unbeaten run of ten games, including that headline grabbing League Cup win over then Premiership leaders Aberdeen and concluding with four straight wins this month, three of whom had caused them more than a few problems last season and the other, Dumbarton, having inflicted an opening day defeat. To that end Stubbs insisted it was pointless to contemplate Rangers’ visit, knowing that even one blip would render such discussion redundant. Today, though, he can look forward to Sunday’s challenge with some relish. He said: “Yes, people have been talking about it but there was not a topic of conversation if we had not done what we have done. “I think that’s the most important thing and the players deserve a lot of credit for that. We have now won seven and drawn one of our last eight league games and given ourselves a platform to have a go at Rangers. Falkirk away last Tuesday followed by Raith Rovers at Stark’s Park were viewed as games which could have blown Hibs off course, those two sides boasting unbeaten home records with only one goal conceded and, in the case of the Fife club, five straight wins on their own turf. So to emerge with all six points to go with a maximum return from a trip to Queen of the South and the visit of Dumbarton represents a monumental effort from Stubbs’ players, the head coach now in the happy position of having his entire squad – long term injury victim Danny Handling apart – available, presenting him with the option to ring the changes as he has done over the past week or so. The diamond formation – with James Keatings playing at the head of it – favoured for the previous two games was ditched in this instance, Stubbs going with a back three to counter the aerial threat of Raith’s Jon Daly. And but for one moment when the veteran striker got free to head home, it worked perfectly, Hibs, as they had done at Falkirk midweek when Stubbs reckoned more than 90 “variations of crosses” were thrown at his side, resolute right to the 99th minute, the game having been extended following a serious injury to Raith substitute Craig Wighton. Having seemingly been coasting after a stunning fourth minutes strike from John McGinn and Jason Cummings’ tenth of the season, Hibs found themselves on the back foot under a similar barrage aided by the long throws of Rovers defender Rory McKeown and, as time appeared to stand still for those in green and white, it became tense and nervous with Liam Fontaine saving the day with a goal-line clearance from former team-mate Scott Robertson with just seconds remaining. Stubbs said: “I thought our first-half performance was very good, we moved the ball around really well and looked really sharp. Second half it became a bit scrappy, stop-start, too many stoppages and that probably gave Raith a foothold in the game. They were able to launch balls into the box and got a goal out of it. “We knew we were going to have to deal with a lot of aerial balls on top of our defence. McKeown’s throw-ins were like crosses but I thought we defended really well. Stubbs admitted to being baffled as to where referee George Salmond found the extra nine minutes even allowing for the delay as Wighton was suspected to have suffered cruciate ligament damage as he tangled with Lewis Stevenson. Raith manager Ray McKinnon was left simply bemused by Salmond’s performance, the official having turned down three claims for a penalty with Daly adamant a late overhead kick had been blocked by the hand of Paul Hanlon, the most legitimate of their appeals, but one which the ref obviously thought was a case of ball to hand rather than the Hibs defender making a deliberate attempt to illegally intercept the shot. McKinnon said: “I don’t like having a go at referees but I couldn’t understand the decision making. Jon Daly was pushed in the back all day then he goes into the box, leans on someone once and gets a foul against him. However, despite seeing his side’s unbeaten home record gone, McKinnon insisted he was pleased with their performance, admitting McGinn’s thunderbolt had rocked his players. He said: “It was a goal out of this world, it put us on the back foot, gave Hibs lots of confidence and then we make a mistake for their second which left us with a mountain to climb.